How is 5G actually going to work? 4G LTE is already providing millions of customers with super fast data, but with more and more carriers looking to flip the switch on even nippier 1 Gbps networks and phones boasting faster modems, it’s tough not to wonder if we’re closing in on next-generation 5G networks soon. Unfortunately, we’re all used to hearing that there are still some technical hurdles to overcome and plenty of infrastructure investments left to be made until consumers start receiving their first 5G signals, but the date is closing in. If you’ve been wondering at what stage all of this new technology is at and just how far away we still are from 5G, 5G Americas, an industry trade association and voice of 5G and LTE for the Americas, has recently published a paper looking specifically at how the industry is steadily advancing. You can read the full white paper here, but we’ve dug through some of the more pertinent parts so you don’t have to, and tucked in some extra insights of our own too. Before delving into the details, here’s a quick recap of what’s expected with the arrival of 5G in the coming years. Peak network data rates will reach 20 Gbps download and 10 Gbps, a 20x improvement over IMT-Advanced 4G. However us users will likely see our data rates hover somewhere above 100 Mbps, up from a typical 10 Mbps with 4G. If that doesn’t seem like a massive speed boost compared with some of today’s fastest networks, remember that we’re already well into the introduction of LTE-Advanced, which is helping to bridge the gap with tomorrow’s 5G networks. In fact, 5G being designed to integrate with LTE connections in a few interesting ways. Some 5G features may even be implemented as LTE-Advanced Pro extensions before the full 5G rollout, including the use of 256QAM, Massive MIMO, and LTE-Unlicensed spectrum. Other 5G improvements are expected to include mobility support up to 500 km/h, 1 ms user plane latency, support for 1 million devices per square kilometer, and bandwidth of up to 1 GHz available from multiple radio carriers. As for timescale, the first 5G specification will be completed in early 2018, enabling the first standards-based networks to be deployed sometime between 2019 and 2020. Broadly speaking, licensed spectrum is still a precious commodity for carriers, and at the moment there doesn’t appear to be enough to go around to reach the lofty specifications sought after by the evolving 5G standard. To help sidestep this problem, 5G is looking to a wide range of spectrum options, including new very high frequency bandwidth above 6 GHz and making use of unlicensed bands to increase capacity. The downside of this approach is that these high frequencies don’t travel very far or penetrate walls as well as low frequencies bands, which are in short supply. Therefore, future 5G networks are going to look more patchworked than today’s networks, combining short, medium, and long distance coverage to increase capacity. In practical terms, this means making use of existing 4G LTE bands and incorporating 5G New Radio (NR) technologies over time, and combining the two by evolving existing carrier aggregation and larger multi-antenna technologies. 5G NR will support not only a range of new use cases, such as mass IoT, but also diverse spectrum as well. The idea is to enable seamless transitions between and simultaneous connections to available bands across long distance, small cell, mmWave, and Wi-Fi frequencies. The combination of lower and higher frequencies is therefore crucial for 5G operation. To make this financially viable for carriers, existing 4G LTE bands will likely remain as they are for the foreseeable future. 5G NR developments and new radio frequencies are instead going to be developed primarily to make use of currently unused cmWave and mmWave frequencies. These short range stations will likely be constructed from densely packed antenna arrays, which is incidentally exactly what’s needed for increased capacity. Furthermore, larger antenna arrays have already been shown to boost the range of even very high frequency implementations. 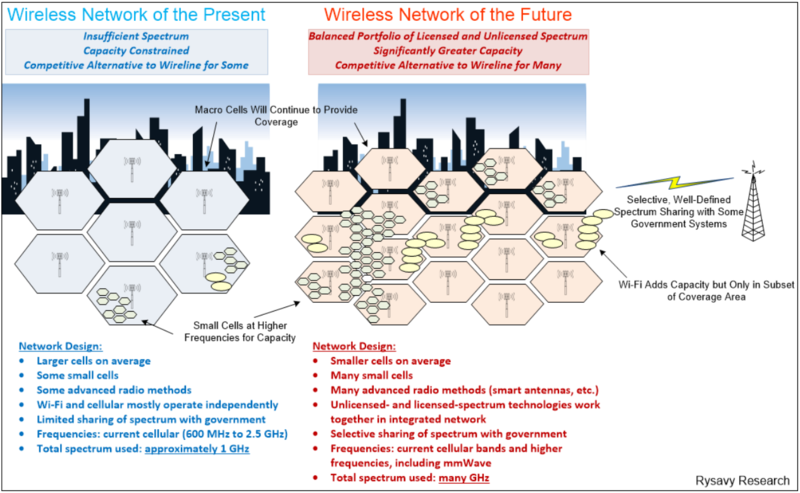 A 2016 NTT DOCOMO study presented at the Brooklyn 5G Summit suggests that a 77 X 77 antenna array of 6,000 elements can exceed a kilometer in distance at 3.5 GHz and can even cover over 800 meters at 30 GHz. Even so, this would require potentially 40 to 50 base stations to provide the same area coverage as 8 to 10 4G stations, although speeds will be much higher. These high frequency, Massive MIMO antenna arrays will require beamforming and/or bream tracking in order to maximise data efficiency to the user. By this we mean the antenna will send a focused stream of data to users rather than current omnidirectional broadcasts. This is done by triangulating the location of the user and using intelligent algorithms to fire data back along an optimal path. Clearly this is more involved and expensive than current technologies, but will greatly increase bandwidth efficiency and allow for the use of very high frequency bands. However, research is still ongoing and final specifications for these high frequency antenna technologies are yet to be finalized. There’s going to more to the 5G standard than just high frequency spectrum though. Increasing coverage and bandwidth over long distances with lower frequency spectrum is just as important, not just for consumers, but for IoT and other connected markets too. In the US this year, the FCC held an auction of low-band 600 MHz spectrum previously used for TV broadcast, which T-Mobile bought 45 percent of. We’re likely to see additional repurposing of low frequency spectrum over the coming years, which will be used to expand 4G and 5G long distance coverage. As TV and radio customers move to consuming more data digitally and over the internet, the need for dedicated analog spectrum is diminishing and it makes sense to repurpose this for faster 5G data. The 3GPP is currently standardizing 5G frequencies in Release 15, which is expected to complete the non-standalone version of 5G in March 2018. Along with new capacity from wireless cell towers, superfast 5G speeds in built up areas will likely require the use of small cell Wi-Fi aggregation backed by fibre broadband in order to deal with the sheer number of users. To do this, 5G will combine aggregated LTE and 5G signals with additional data transmitted in the unlicensed spectrum. The 2.4 GHz and 5 GHz bands are commonly used by today’s WiFi routers, with the 3.5 GHz band available to add further spectrum in the future. The FCC is also in the process of opening up the 3550 to 3700 MHz CBRS band for future use with these small cells. We won’t necessarily even have to wait until 5G technologies begin appearing around 2020 to start seeing the benefits of unlicensed spectrum. Smartphone processor packages are already increasing support for LTE-U, and the most recent 3GPP Release 13 outlined License Assisted Access (LAA) specifications and support for LWA/LWIP. In the US, T-Mobile already has its own LTE-U service up and running in Bellevue, WA; Brooklyn, NY; Dearborn, MI; Las Vegas, NV; Richardson, TX; and Simi Valley, CA. LTE-U is being spearheaded by Qualcomm and its partners. Essentially, the principle is to have LTE bands operating within the same frequency range as common Wi-Fi signals. However, due to the regulations set by the FCC, LTE-U devices must meet the same power limitations as the Wi-Fi devices that exist today, limiting their range. Even so, adding LTE bands into the Wi-Fi spectrum is one way to provide additional capacity. The big question raised with unlicensed spectrum is how will this affect regular Wi-Fi users? Won’t their home connection quality suffer from high congestion and smartphone users clogging up broadband data? Using unlicensed spectrum certainly isn’t the definitive answer to the capacity problem, and care is being take to to ensure that current infrastructure doesn’t buckle with LAA. LAA is essentially the standardized version of LTE-U governed by 3GPP. The big difference between the two is that LAA mandates a “listen-before-talk” capability, which scans local Wi-Fi usage and automatically picks a 5 GHz channel clear of WiFi users, at the cost of some system latency. Failing that, the technology shares the same channel but LAA data is given a lower priority than other Wi-Fi users to fairly share data. Listen-before-talk is a requirement for unlicensed operation in Europe and Japan, but isn’t enshrined in regulation in the USA, Korea, or India, hence why those countries are focusing on LTE-U instead. The upcoming Enhanced LAA (eLLA) specification in Release 14 will enable uplink use of unlicensed spectrum too. The other option is to piggyback on existing Wi-Fi networks, rather than having to deploy new LTE cell technologies into the unlicensed spectrum. LTE-WLAN Aggregation (LWA) was also standardized as part of the the 3GPP’s Release-13, and enables seamless usage of both LTE and Wi-Fi networks at the same. In this case, the LTE signal isn’t competing with Wi-Fi, instead the phone connects to traditional lower frequency LTE bands and common Wi-Fi hotspots simultaneously, and aggregates data across both. The upside is that it’s much more cost effective and simplifies deployment for carriers. LWA deployment also doesn’t risk clogging up Wi-Fi frequency with new LTE implementations. The difference with LWIP technology is that LWA aggregates LTE and Wi-Fi at the packet data layer, while LWIP aggregates or switches between LTE and Wi-Fi links only at the IP layer. So with LWA, data can be split at the smallest level for all applications, which greatly increases throughput. LWIP has to toggle IPs for each application but works well with legacy Wi-Fi hardware. Currently LWA doesn’t support uplink, but this will change with the arrival of enhance LWA (eLAW) in Release 14. While a lot of this still might sound like a way off, some of today’s smartphones are already actually ready to go with a number of these technologies. Carrier aggregation and LTE-Advanced has been around for a while now, and Qualcomm’s existing X12 and X16 modems inside a range of Snapdragon mobile platforms already support LTE-U. The company is preparing to sell its multi-mode 4G/5G X50 modem to partners in the coming months too, and ARM has its Cortex-R8 CPU targeted at others companies who are looking to design their own modems. There’s a lot going into future 5G technologies and although it’s an unfinalized and evolving technology at this point, many of the ingredients are already built into today’s smartphones and other gadgets. Although carriers will no doubt celebrate firing up their first 5G networks, in reality we’re looking at a gradual evolution through the rollout of LTE-Advanced and Advanced-Pro, which will mean that many of us will already be using some next-generation wireless features by the time the carriers flip their 5G switches.